The land of Israel and its produce have always held a special place in Jewish hearts and minds. Israel is on the cutting-edge of agriculture technology, and its fruits and vegetables are renowned for their quality and flavor. The first separation from produce (approximately 2%), teruma gedolah is given to Kohanim (members of the priestly family) to be consumed by them in a state of ritual purity. Today, Kohanim are ritually impure, and therefore may not eat terumah. The terumah must be wrapped carefully (to avoid desecration) before it is discarded. 10% of the remaining produce is designated ma’aser rishon. This is normally given to the Levi, but may today be eaten by anyone. 10% of the ma’aser rishon is separated and is designated for the Kohen. Just as teruma gedolah, this may only be eaten by a Kohen who is ritually pure, and it is therefore left uneaten today. It, too, must be wrapped before it is discarded. Fruit that a tree or vine bears during the first three years of the tree’s existence is orlah, and is biblically prohibited from being eaten. Fruits from the fourth year from the time of planting is neta revai. These fruits would be taken to Jerusalem and consumed there. Today neta revai is redeemed onto a coin and then eaten normally. Although much of the produce grown and distributed in Israel is specially supervised and separations arranged, this is not the case for produce targeted for export. When we see produce from Israel available in North American markets, we may be excited but concerned. Many of us in the Diaspora are unfamiliar with the procedures and special requirements of terumot and ma’asrot (separations and tithes) and orla (avoiding fruit in its first three years of growth). As a result, many avoid the coveted produce altogether. Mehadrin Tnuport, Israel’s largest fruit grower and distributor, is the purveyor of the famed Jaffa brand citrus products. 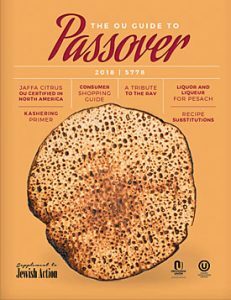 Now OU Kosher and Mehadrin have teamed up to make Jaffa products available in the United States and Canada, meeting all the special requirements of Israeli produce — satisfying both the palate and the halachic standards of even the most discerning kosher consumer.